The Netgear AC1200 R6220 is budget-friendly dual-band wireless router which aims at catering to the needs of those people that find the latest devices (mostly AC1750+) with all their bells and whistles unnecessary. Sure enough, the R6220 should be well suited for the users that live in small apartments and that expect to only have a handful of connected devices, but is that the case any more? 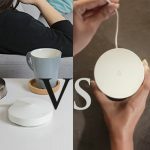 Ever year, a new ‘common’ device ‘smartens up’ and can be connected to the WiFi network, so, without realising, there are more and more devices in our homes that depend on a reliable wireless connection. 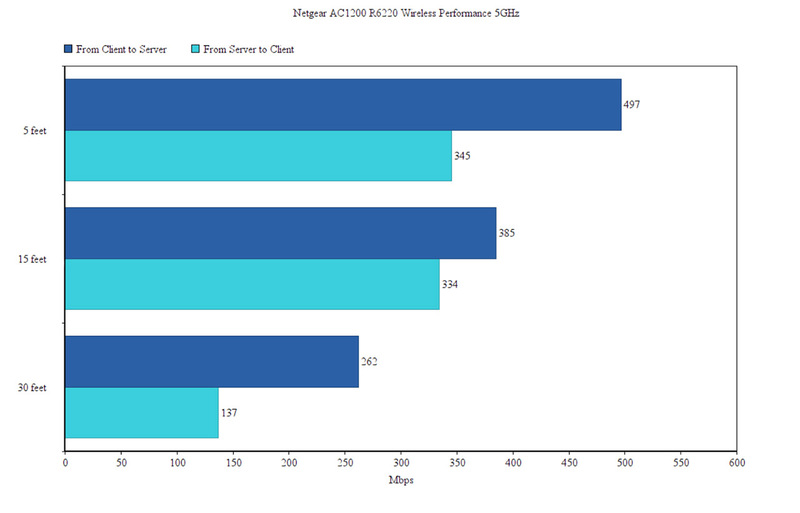 While it’s true that the home network has become more demanding, not many WiFi adapters are compatible with the latest technologies, so, even if the R6220 hasn’t adhered to any of the flashy WAVE 2 technologies, it should still deliver a decent wireless performance (and, if the number of clients is large, you could always have a look at the Nighthawk series). 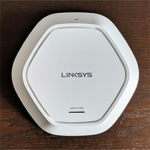 The competition is not that high for the entry-level routers and it’s always nice to see newer devices (such as the pcWRT and the TP-Link Archer C1200) or products that have withstood the test of time, such as the subject of this article, the Netgear AC1200 R6220, so let’s have a closer look and see if this router still offers enough for today’s standards. 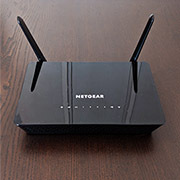 The Netgear AC1200 R6220 is not part of the Nighthawk series (it belongs to the Smart WiFi family), so don’t expect to see a dynamic, angular case, instead, the router is a bit more conservative, featuring a smaller rectangular plastic body on the top covered by a black glossy finish (that easily retains fingerprints) and with two antennas pointing from the rear side (similarly to the Asus RT-ACRH13 and RT-ACRH17, the antennas can’t be removed nor upgraded, but remain omni-directional). 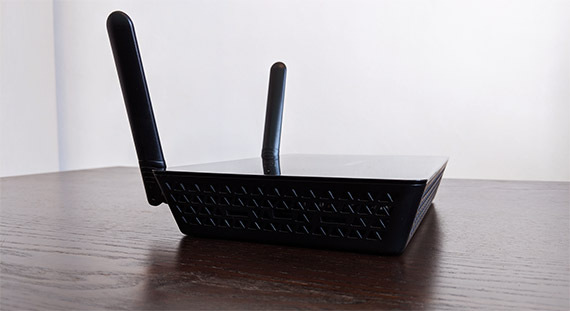 On the front, lateral sides and the bottom, the R6220 is covered by lots of triangle shaped cut-outs (although the front ones are solely for increasing the aesthetic value of the device, while the others actually have the role of keeping the router at a decent temperature). 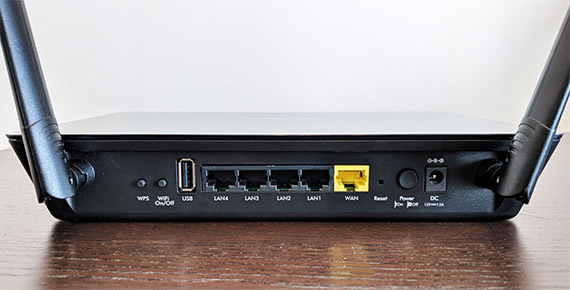 The Netgear R6220 was created as a replacement to the R6200 (which reached EOL) and, while at first it may not be obvious since the latter is a device that can only be positioned vertically, these two routers have a lot of design elements in common: just remove the stand from the R6200, add two antennas to one side and you get the AC1200 R6220. Some manufacturers cheapen out on the design for their entry-level models, but this doesn’t seem to be the case and the Netgear R6220 feels solid and there is no flex when pushing from the top surface. 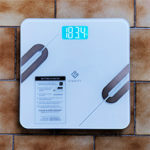 Still, the router is surprisingly light (0.84 lbs) considering its size (9.43 x 7.14 x 1.59 inches), but, the manufacturer has added four small silicone pads on the bottom to keep the device from budging (and they do a relatively decent job when multiple cables are connected). 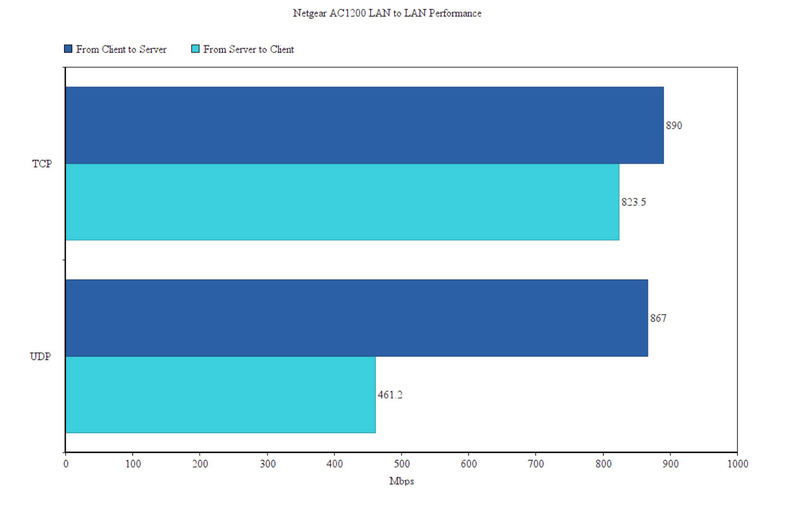 In terms of heat management, the Netgear AC1200 R6220 should be able to keep the temperature as low as possible because of the multitude of ventilation holes and the increased height and, while I was testing the router, it did warm a bit near the label on the bottom, but it was barely noticeable, so no, it did not overheat (even if the chipset is not really that efficient as its modern alternatives). 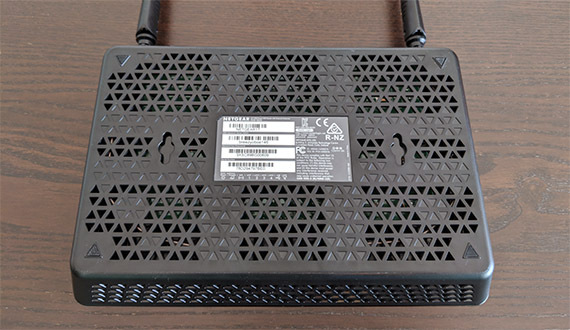 Even if it’s not really a new device, the minimalist design of the R6220 and its small antennas should still allow it to be positioned pretty much anywhere in the house and, if you’re short on space, Netgear has added a couple of holes on the bottom side to easily mount the device on the wall. The top side is a simple glossy surface and the only thing that breaks the monotony is the Netgear logo and the array of LED indicators which have the role of showing the status of the system and the network: from the left, there’s the Power LED (if it’s flashing green, then either the software is being upgraded or the device is returning to the default settings), the Internet LED, a single LED indicator for both radio bands (2.4GHz and 5GHz – if it’s flashing, then the router is receiving/sending data packages), four LEDs, each for one LAN port, a USB LED (flashing green indicates that an external drive was plugged in and is trying to establish a connection to the router) and a WPS LED (if it flashes for 2 minutes, then the WPS pairing process has been initiated). On the rear side, in between the two antennas, rests the WPS button, the WiFi On/Off button, a USB 2.0 port (yes, the old standard, but that’s to be expected), four RJ45 Gigabit Ethernet LAN ports, one WAN port (Gigabit), a small recessed Reset button (press and hold the button for at least 7 seconds to return the router to the factory default settings), a Power On/Off switch and the DC In Power port. 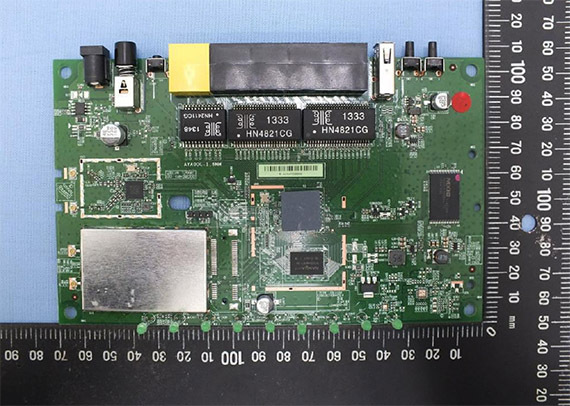 Inside the case, Netgear decided to equip the R6220 with the single-core (dual thread) MediaTek MT7621ST SoC, clocked at 880 MHz, 128 MB of RAM (Nanya NT5CB64M16FP-DH), 128 MB of flash storage (Macronix MXIC T140705 MX30LF1G08AA-TI), a couple of HN4821CG 10/100/1000 Base-T LAN Transformer Modules and the router also uses the MT7621ST as the switch chip. Furthermore, the 2.4GHz wireless band uses the MediaTek MT7603EN 1422-BMAL WiFi chip (2×2:2, 802.11b/g/n), while the 5GHz band uses the MediaTek MT7612EN 1411-BMAL chip (802.11ac+an 2×2:2). 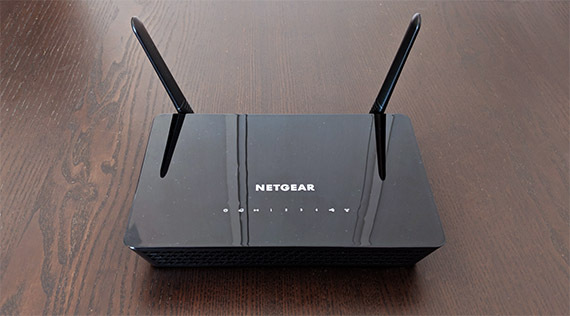 The Netgear R6220 is advertised as an AC1200-class router, so it features a maximum theoretical data transfer rate of 867 Mbps on the 5GHz band, while on the 2.4GHz band, it features a maximum theoretical data transfer rate of 300 Mbps (summed to 1,167 and rounded to 1,200 Mbps). 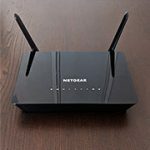 The Netgear AC1200 R6220 is considered an entry-level router, so it hasn’t implemented some of the more popular features that have the potential to enhance the wireless performance (such as the MU-MIMO technology, 80+MHz or an additional radio band – at the same time, one of its competitors, the RT-ACRH13 does come with MU-MIMO), but it does support the WiFi BeamForming technology on the 5GHz band (802.11ac), so the signal is going to be focused towards the connected clients to ensure a more stable network and a better throughput (due to less interferences). 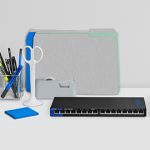 Furthermore, the R6220 is a dual-band router, so the clients can connect to either of the two available networks, but it doesn’t seem to have implemented any type of band steering tech, which would have made sure that one band would not get overcrowded. 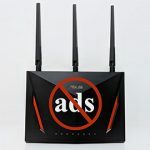 If you were wondering if there is any chance that the AC1200 R6220 would work as a node within a mesh network, well, unfortunately no, Netgear has not made any steps towards developing something similar to the Asus AiMesh, but it does have its own WiFi system called the Netgear Orbi that uses a form of mesh network (even if Netgear wanted to, the MediaTek SoC will have to be changed in order to reliably ensure that the R6220 could interconnect to other Netgear routers). 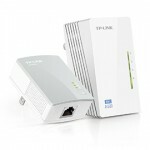 To test the wired performance of the Netgear AC1200 R6220, I took a Desktop computer equipped with an Asus PCE-AC88 WiFi adapter (will act as the client), as well as a powerful laptop that will function as the server and I connected these two PCs to the router using CAT6 Ethernet cables: from the client to the server, the router delivered an average of 890 Mbps (TCP) and 867 Mbps (UDP), while from the server to the client, it delivered an average of 823.5 Mbps (TCP) and 461.2 Mbps (UDP). 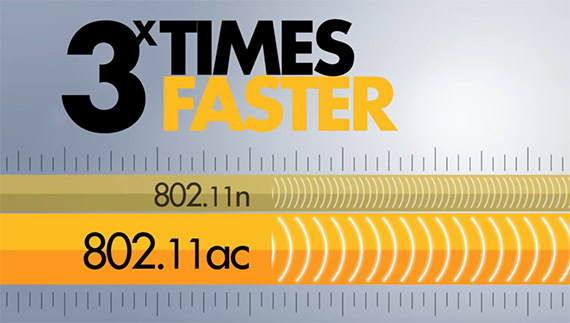 Afterwards, to test the wireless performance, I connected the client device to the 5GHz network and, from the client to the server, at 5 feet, I measured an average of 497 Mbps, while at 15 feet, just an average of 385 Mbps; at 30 feet, the router delivered around 262 Mbps. From the server to the client, I measured an average of 345 Mbps at about 5 feet from the router, while at 15 feet, I got an average of 334 Mbps; at 30 feet, the speed went down to 137 Mbps. 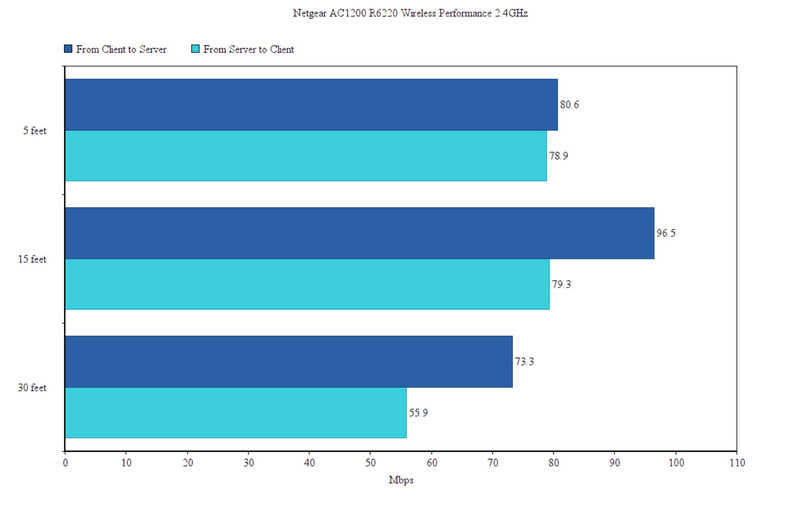 On the next step, I connected both computers to the 2.4GHz network and, from the client to the server (at 5 feet), I measured around 80.6 Mbps, while at 15 feet, the speed actually went slightly up to 96.5 Mbps; at 30 feet, I measured an average of 73.3 Mbps. From the server to the client, I measured an average of 78.9 Mbps and, at 15 feet, the throughput averaged slightly above to 79.3 Mbps; at 30 feet, I measured around 55.9 Mbps. Since the Netgear R6220 comes with a USB 2.0 port, I had to test the storage performance and, using a Samsung T5 SSD drive (256 GB), I moved a 2.5GB multimedia folder: writing the folder, I measured an average of 22.1 MBps, while reading it, delivered an average of 30.4 Mbps (it may not look like much, but it’s quite decent for a USB 2.0 port). 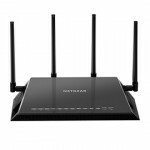 The Netgear Nighthawk series can be configured using either the traditional way (via the web-based interface) or by using the dedicated Nighthawk app (as I recently saw with the Nighthawk R7000P). 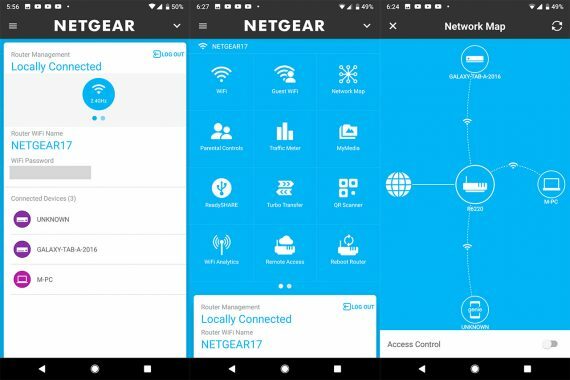 Fortunately, the Smart WiFi series can also be configured using an app, so, to initiate the Setup Wizard, I decided to install and run the Nighthawk app. For some reason, the app didn’t recognise the router, so, to install it, I chose the Sign In option near the WiFi SSID (since the Nighthawk app was out of the picture, the router can still be afterwards managed and monitored using the Genie application, which is compatible with both the iOS and the Android OS). On the first step, I had to let the Netgear genie UI detect the type of Internet connection that I have in my home, insert the ISP username and password (since it was PPPoE), configure the Admin Account Settings (a new password) and, afterwards, wait for the Wizard to check for the latest firmware. 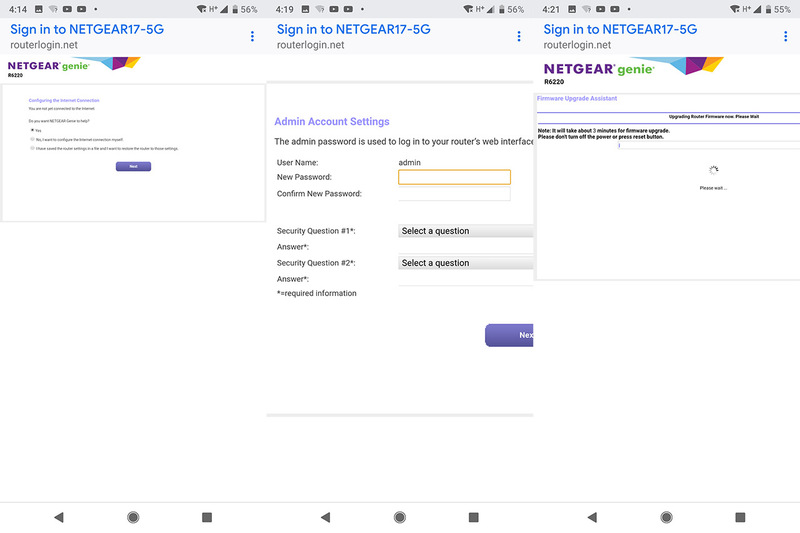 The process doesn’t have many steps, but is does take more than 5 minutes to finish – afterwards, you could log into the Netgear Genie app (it supports both Local and Remote access). 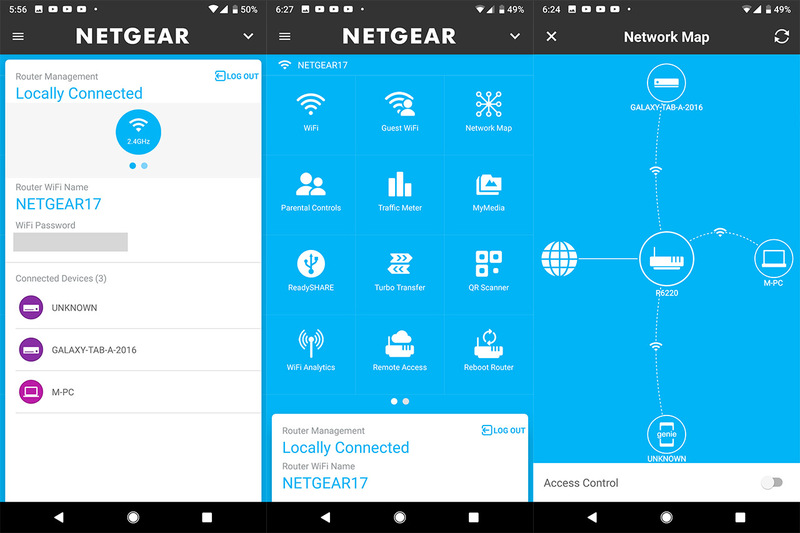 The mobile interface has two main sections, one is on the bottom, where you have logged in and it shows the SSID and password of each network, as well as all the connected clients, while towards the top, there’s a menu with the most important options. First, there’s the WiFi section where you can change the SSID, the password, the security type and the channel (you can also view the Signal Strength and the Link Rate), then, there’s the Guest WiFi, where you can create two separate Guest Networks; the Network Map shows a graphical representation of your network, displaying all the connected devices (tap on the name to view detailed info about the client) and it allows you to enable the Access Control (this adds the ability to pause the Internet for any connected device). Next, there’s the Parental Controls, which relies on OpenDNS, there’s also the Traffic meter (shows the total and the average transferred data), MyMedia (shows both client Sources and any Speakers connected to the network) and ReadySHARE. 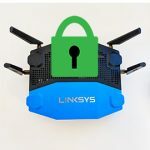 Other options that are worth mentioning are the Turbo Transfer (useful for receiving and sending files in the local network), Remote Access and the ability to Reboot the router or to Register the Product. Switching to the web-based interface (accessible by going to 192.168.1.1 – the default IP address) shows the same layout that we got accustomed with, which divides the settings into Basic and Advanced. The Basic section includes the Home tab (various network and router stats displayed into 6 mini-windows), the ability to set up the Internet connection or to change the Wireless settings (for either of the two bands), view all the Attached Devices (and enable the Access Control, a feature that can block the access to the Internet for specific devices), the Parental Control (unlike the app, I was surprised to see that the browser sent me to the Circle with Disney page – similarly to how the R7000P worked, but apparently not as perfectly integrated), ReadySHARE (for connected external storage devices) and the Guest Network. The Advanced section includes the ADVANCED Home (more stats than the Basic Home), the Setup Wizard and the WPS Wizard. 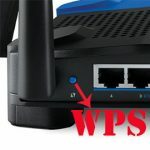 There’s also the Setup group (allows you to set up the Internet, the Wireless, the Guest Network, the WAN (includes MTU Size, NAT Filtering and VPN Passthrough – IPSec, PPTP and L2TP), the LAN and the QoS (includes WMM, the ability to set a maximum uplink bandwidth, to create QoS rules and set QoS by Device)), the USB Storage, the Security (includes the Access Control, the Block Sites and Block Services filters), the Administration (includes the Logs, the Backup Settings, the NTP Settings and the Firmware Update) and the Advanced Setup (offers more in-depth Wireless Settings, the ability to run the device in Access Point Mode or Wireless Repeater Mode, it also includes the port Forwarding/Port Triggering feature, Dynamic DNS, VPN Service, Static Routes, UPnP, IPv6 and VLAN/IPTV Setup). 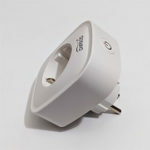 Overall, I felt that the web-based interface is slow, the router takes its time to load any new windows, it takes its time connecting to the Internet if you removed the cable and it takes a while to apply settings and restart, so you need a lot of patience. But what I did like about the software is that it’s still being kept up to date even in 2019 (the latest update has been released in February). Without a doubt, the Netgear AC1200 R6220 is an entry-level wireless router, but it’s still a surprisingly decent device especially if you need to connect multiple compatible devices to the 5GHz network (and I noticed that more and more devices have distanced themselves from the older 802.11n standard). Sure, it lacks all those fancy WiFi enhancing features, but, as I said in the introduction, it will suffice for a small home. At the same time, it does have one annoying shortcoming: the web-based interface. 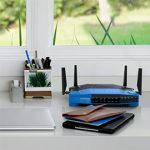 It’s feature-rich, it offers everything you would want from a router (especially considering the price tag), but it’s so slow and it takes ages to modify and apply any settings. At the same time, if you’re not bothered by that and want a decent budget wireless router, it’s definitely worth checking out the Netgear R6220.